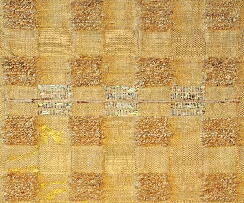 in her experience of working in the production of artworks for kimono and architectural objects. 1988　Worked at ICHIDA Corporation Kimono Division, assigned to Merchandising, Sales promotion & Marketing staff. Commission Works　some works discarded due to various circumstances. 2010.06.14-06.24　The Publication Memorial Exhibition of "Dying・Weaving・Fiber Arts "/ ART BOX GALLERY Ginza, Tokyo. 2014.03.10-03.22　Japan Contemporary Art Exhibition -Quintessence du Yamato a Paris- / La Galerie Mona Lisa , France. 2016.05.17-05.21　Competition DISCOVER THE ONE JAPANESE ART by 100 Japanese artists / Menier Gallery , Lomdon, U.K.